Thousands participated in the Vancouver leg of the financial protests. 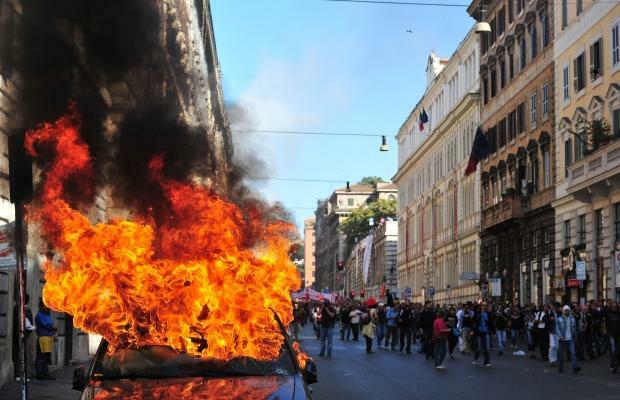 Demonstrators march past a burning car in downtown Rome on October 15, 2011. Tens of thousands marched in Rome as part of a global day of protests inspired by the “Occupy Wall Street” and “Indignant” movements, with the Italian capital under a security lockdown. RAW VIDEO – Italy – Riots in Rome – Italian Indignados Protest Turns Violent. ITALY. Riots in Milan. Students Protest Turns Violent. Assaulted Goldman Sachs Office. ROME: Protesters torched cars, smashed up banks and set fire to a military building in Rome on Saturday in the worst violence of worldwide demonstrations against corporate greed and government cutbacks. Tens of thousands took to the streets of the Italian capital for a march that turned violent and equal numbers rallied in Madrid and Lisbon while WikiLeaks founder Julian Assange joined angry demonstrators in London. The protests were inspired by the “Occupy Wall Street” movement in the United States and the “Indignants” in Spain, targeting 951 cities in 82 countries across the planet in Asia, Europe, Africa and the Americas. It was the biggest show of power yet by a movement born on May 15 when a rally in Madrid’s central Puerta del Sol square sparked a worldwide movement that focused anger over unemployment and opposition to the financial elite. “I think it is very moving that the movement that was born here has extended throughout the world. It was about time for people to rise up,” said 24-year-old Carmen Martin as she marched towards Puerta del Sol. The protests received unexpected support from Italian central bank governor Mario Draghi, a former executive at Wall Street giant Goldman Sachs set to take over as president of the European Central Bank. “Young people are right to be indignant,” Draghi was reported as saying on the sidelines of talks among G20 financial powers in Paris. “They’re angry against the world of finance. I understand them,” he added, though expressing regrets at reports of violence. More protests were staged in Amsterdam, Athens, Brussels, Geneva, Paris, Sarajevo and Zurich. Thousands also rallied across Canada and in New York and Washington, where they protested outside the White House and the US Treasury. Five people were arrested, three for assaulting police officers and two for public order offences, Scotland Yard said. Three lines of police, and one line at the rear on horseback, blocked them from heading to the London Stock Exchange and pushed back against lead marchers, some wearing masks. “One of the reasons why we support what is happening here in ‘Occupy London’ is because the banking system in London is the recipient of corrupt money,” Assange said from the steps of St Paul’s, flanked by bodyguards. 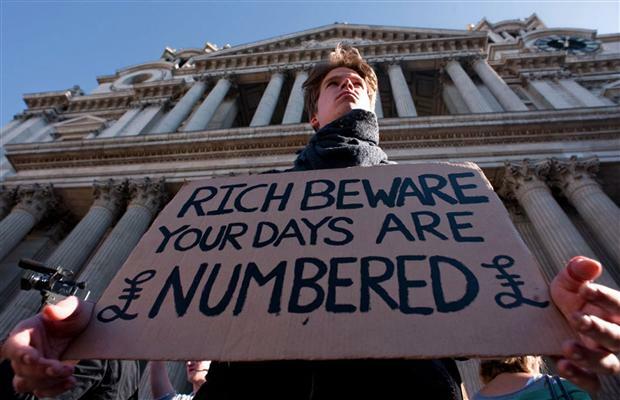 A protestor holds a placard on the steps of Saint Paul’s cathedral in central London on October 15, 2011. Police arrested 24 protesters at a bank as thousands marched in New York, where the Occupy Wall Street movement that sparked the global demos began on September 17 with activists taking up residence in the heart of the Financial District. In Miami, a city that rarely hosts mass demonstrations, at least 1,000 people marched downtown. The crowd included youth and retirees standing up against corporations, banks and war. No police could be seen as the group approached government buildings. Over 10,000 Canadians blew bubbles, strummed guitars and chanted anti-corporate slogans at peaceful protests in cities across the country. “I believe a revolution is happening,” said 30-year-old Annabell Chapa, who brought her one-year-old son Jaydn along in a stroller. The European Union also became a target for anger as the eurozone debt crisis continues, with some 9,000 protesters marching to the EU’s headquarters in Brussels and rallying outside the ECB’s headquarters in Frankfurt. In Rome, the march quickly degenerated into running street battles between groups of hooded protesters and riot police who fired tear gas and water jets into the crowd amid a security lockdown in the Italian capital. “Today is only the beginning. We hope to move forward with a global movement. There are many of us and we want the same things,” said one protester, Andrea Muraro, a 24-year-old engineering student from Padua. “Only One Solution: Revolution!” read a placard. One group carried a cardboard coffin with Italian Prime Minister Silvio Berlusconi’s name on it. Berlusconi later condemned the “incredible level of violence” at the march. Seventy people were injured in the clashes and treated by medics, including three in a serious condition, Italian news agency ANSA reported. Backing from Italy’s main trade unions and student movements boosted the numbers at the protest in Rome — in contrast to most of the other rallies. As the day began, around 500 people gathered in the heart of Hong Kong’s financial district to vent their anger. About 100 demonstrators in Tokyo also voiced fury at the Fukushima nuclear accident. Jewish ‘Heroes’ Contest: “self-loving” Jew VS “self-destructive. Hundreds of unionized workers rallied in Tokyo on Tuesday to protest massive job cuts, accusing the country’s biggest companies of sacrificing jobs to protect profits. The global financial crisis has forced some of Japan’s corporate giants to take drastic measures including job cuts, suspending production, postponing projects and closing factories. Sony Corp., Toyota Motor Corp. and Nissan Motor Co. are among the major employers to trim thousands of workers from their payrolls. About 200 protesters waved banners and shouted slogans through loudspeakers outside the headquarters of the Nippon Keidanren — Japan’s largest business lobby group — in Tokyo’s main business district. Most of the job cuts have targeted temporary contract workers, but lately they have included full-time salaried workers. Speakers at the protest said some newly unemployed contract workers also lost their company-owned housing, leaving them jobless and homeless. 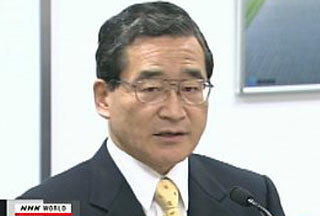 Fujio Mitarai, head of Keidanren and also chairman of Canon Inc., said the influential lobby “will cooperate with the government” to implement job security measures. Japanese exporters have been hit hard by slowing consumer demand from abroad and the yen’s appreciation, which erodes their overseas earnings. Sony announced plans to slash 8,000 jobs around the world — about 5 percent of its work force — and lowered its full-year earnings projection 59 percent from the previous year. Major automakers including Toyota and Nissan have terminated contracts with thousands of seasonal workers at their factories and parts makers. Citing their own tally, union members say more than 18,800 people, mostly contract workers, have lost their jobs in recent months. The government last week announced a 23 trillion yen ($256 billion) stimulus package to shore up the economy, including measures to encourage employment. Thousands of Renault workers braved heavy rain to march through the central Spanish city of Valladolid Saturday to protest a work reduction plan by the French automaker at its four plants in the country. Renault management in Spain on December 3 proposed the 2009 cuts at its two factories in Valladolid, one in the nearby town of Palencia and another in the southern city of Sevilla. Workers at one of the Valladolid plants are also waiting for Renault to assign it a new vehicle for production that would ensure its survival. The protesters, who numbered 25,000 according to unions and 16,000 according to police, marched through the city in driving rain before a statement was read out calling on Renault to guarantee staff levels, Spanish media said. “If this isn’t resolved, war, war and war,” the protesters chanted. Renault employs around 11,000 people in Spain, Europe’s third-largest automaker, of whom 9,800 work in its four factories. The company proposed a 60-day work reduction plan at one Valladolid plant and a 30-day cut at the other three factories. The company blamed “the strong and continued fall in European markets, the main destinations of Renault Spain products” for its decision. The auto manufacturing sector accounts for just under 10 percent of Spain’s economic output and 15 percent of exports. Several large automakers in the country have already taken measures to cut their workforce, such as Japan’s Nissan and US group Ford. Prime Minister Jose Luis Rodriguez Zapatero late last month announced an 800-million-euro cash injection for the country’s auto sector, part of an 11-billion-euro (14.3-billion-dollar) stimulus package to help the country cope with the global financial crisis. Japan is preparing to offer $100 billion (£68.3 billion) of its foreign exchange reserves to bolster the International Monetary Fund’s (IMF) coffers, government sources have told The Times. Senior government sources in Tokyo added that Japan’s proposals at today’s Group of 20 industrialised and emerging nations meeting in Washington could go beyond the huge financial endowment to the IMF and would seek to make Taro Aso, Japan’s Prime Minister, the “Gordon Brown of Asia”. Among Mr Aso’s reading material for the 11-hour flight to the US capital, is a proposal from within his own party that suggests establishing a vast “World Stabilisation Fund” that would invite contributions from forex reserves held by governments everywhere. The immediate Japanese offer to the IMF, expected to be unveiled today in Washington, is designed to increase substantially the IMF’s ability to lend to emerging economies savaged by the global financial crisis. largest coffer of foreign reserves – some $980 billion. Mr Aso, will announce the offer at today’s G20 meeting, but government sources say that he will “gauge the mood of international co-operation” before suggesting any further measures. Finance ministry sources confirmed that Mr Aso was “preparing to demonstrate Japan’s commitment to global financial stability through its foreign reserve strength”, and that “the ability of the IMF to lend aggressively through this crisis must be a priority”. Although details of the plan have not been widely disclosed throughout the Government, it is understood that the reserves – already mostly held in the form of US Treasuries – would be offered as collateral for the IMF as it attempted to raise funds as emergency needs arise. Japan is proposing to lend about 10 per cent of its reserves to ensure that the IMF is itself able to meet its funding demands. However, the loan will need to be structured carefully, said Japanese government sources, so that the facility does not actually lead to a sell-off of US Treasuries in an already unstable market. The Japanese Government is privately hoping that its actions will prompt other nations with hefty foreign reserves to make similar offers to the IMF, though it is likely to stop short of making an explicit demand that others follow suit. China, with even larger reserves than Japan, is viewed as a likely candidate to provide collateral, as are Middle Eastern oil producers. Japan Bailing out the IMF Alrighty then. Because of the US mess. How interesting it all is. Before you know it the Countries who Bailed out the IMF will need bailouts to pay for the money given to the IMF for Bailouts. So who will be left to Bail them out I wonder? Japan should just cut out the middle man and bailout the countries on it’s own. That would save money in the end I am sure. Middle men always have to get a cut out of any transaction.